California Unpaid Wages Lawyer | The Turley Law Firm P.C. This is the most comprehensive website on California unpaid wages law. If you scroll down on this page - you will find links to great free articles on just about every important issue in California wage law, California wages class actions and/or PAGA cases. What can I do if I'm not paid all of the wages that I'm owed? According to many recent studies, California employers fail to pay workers in hundreds of million of dollars each year in unpaid wages. Since you’re reading this, you are probably one of them. Based one what I see is that while many folks suspect their employer is not paying them all of the wages they have earned, nobody really realizes the extent of how many different ways they are being cheated out of wages and how much it all adds up to. Meaning that most employers if they aren’t paying you your hard earned wages in one way, they are probably doing it a bunch of other ways also. Often times these amounts can seem small. A few minutes here or a few minutes there. But when you add them up over the course of a month or a year - they really add up. And if they’re doing it to you, they’re almost always doing it to other workers also. You can do a lot about not being paid the wages that you're owed. This website is all about educating you about how you're wages are being stolen and helping you do something about getting your hard earned wages back. Who is California's best wage and hour lawyer/ employment lawyer? 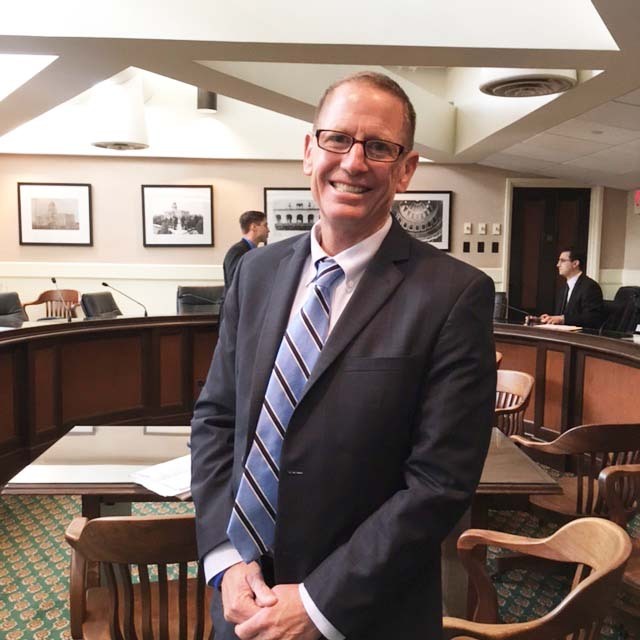 According to many folks, Bill Turley is considered California's best wage and hour lawyer - he's the unpaid wages class action attorney that's chosen to testify before the California State Senate and California State Assembly on wage and hour law. Bill was the workers lawyer in the historic California Supreme Court case - Brinker vs. Superior Court. Bill helped write the recent changes to the unpaid wages PAGA laws. We're not saying he is the best reviewed California wage lawyer to brag - it's so you know that he really is THE expert on California wage law. It's why Bill was named "California's Leading Wage and Hour Class Action Lawyer." Believe it or not, Bill is known for being a no B.S. straight-up lawyer. Besides being known as one of the leading experts on this area of the law in California, one of the reasons why Bill is asked to testify at legislature hearings when California law is being made - - is because he is known for being straight-forward and blunt. He is known for being no B.S., with no lawyer-talk, no double-talk. It's important that you understand your wage rights under California law. This website is all about giving you the knowledge so you can stand up and do something about you're not getting paid all the wages that you have worked so hard to earn. What can I do when I'm not paid on time? How to claim my confidential, free, no obligation unpaid wages analysis. How can I calculate the unpaid wages that I am owed? What are my time limits for bringing an unpaid wages case (statutes of limitations for wage cases)? Am I owed waiting time penalties? What can I do if I don't get paid on time? What are California minimum wage laws? Misclassification / Independent Contractors: Am I owed wages if I was misclassified as an independent contractor? Gathering unpaid wages evidence: How do I gather evidence to win my unpaid wages case? PAGA penaltiee: How can I receive PAGA penalties? Wage theft is when companies steal their employee's wages and is probably one of the biggest problems for workers in America today. It’s an expensive problem too, a multi-billion dollar a year problem in fact. Chances are, it is your problem too. It can be a few minutes shaved off here, an hour overtime deducted there or an auto-deducted, non-existent meal break for some workers. This time is time you are working and not getting paid. And let me tell you that time and that money adds up quick. In some cases we could be talking thousands or even tens of thousands of dollars a year. I know about wage theft, I know how unfair it is, I see it every day. Which is why I have been asked to testify before the California State Senate and the California State Assembly on wage theft issues. And why I have been asked to draft proposed legislation on stopping wage theft with the United States Senate Commerce Committee. Violating minimum wage laws, not paying overtime, forcing you to work off the clock, not paying you for all the time that you worked, time-shaving, not providing you meal periods, not authorizing and permitting rest periods, not paying you wages in a timely manner, not providing accurate pay-stubs and other such illegal activity all falls under the umbrella of wage theft. California wage laws come from three main places - the California Labor Code, California Wage Orders and California courts. Based on what I see, these companies steal their employees' wages weekly and most of the time these employees have no idea it's even happening. This is where you come in. You need to stand up, not just for yourself but for your co-workers too, and say, “No, I am not going to take it anymore”. Then it's time to lawyer up and plunge into the battle to get your hard-earned wages back. We're not saying this to brag. We're telling you this so you will know that Bill knows what he's talking about. Bill Turleyrepresented the workers in the leading California Supreme Court case on California unpaid wages law - Brinker vs. Superior Court. Bill wrote the winning briefs in the recent California Supreme Court cases - Augustus vs. ABM (the leading case on rest breaks) and Williams vs. Superior Court (the case that gives you the right to getting the names of your co-employees in a PAGA case). 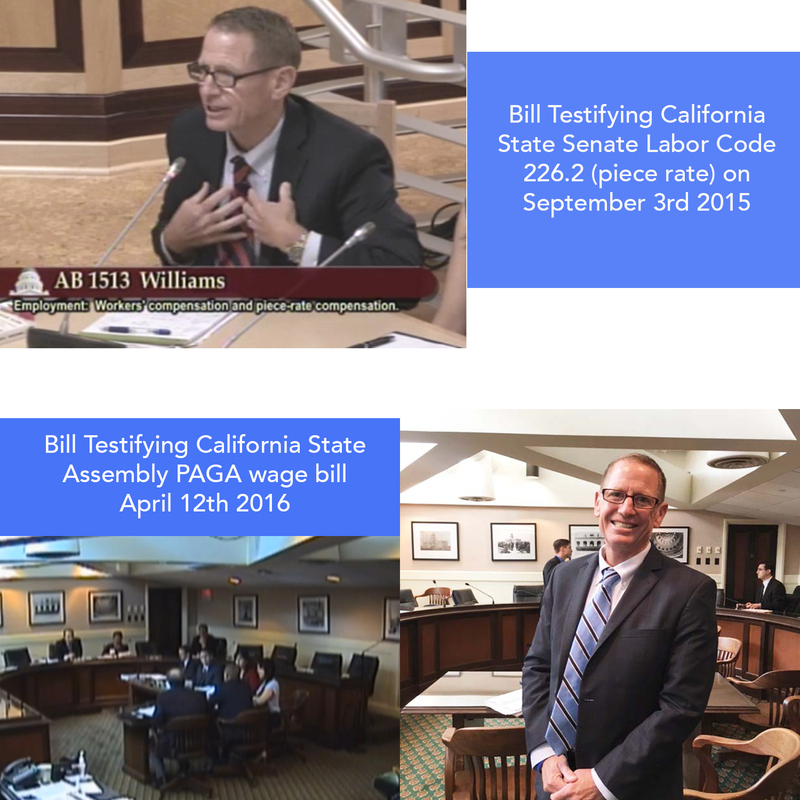 I am regularly asked to testify before the California State Senate and the California State Assembly on unpaid wages law. I helped write the recent changes to California's unpaid wages PAGA laws. 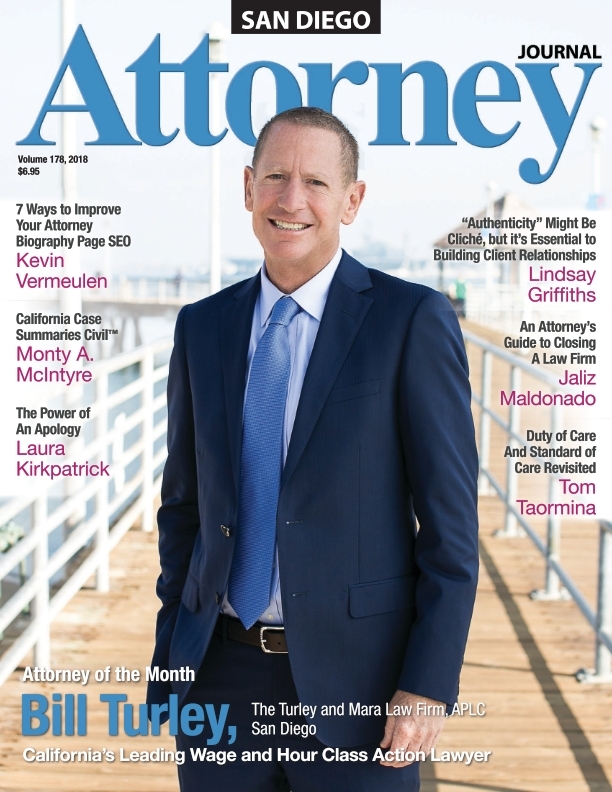 Bill was recently names "California's Leading Wage and Hour Class Action Lawyer" on the cover of San Diego Attorney Journal. I want make my knowledge and experience of California wage laws available for every driver, warehouse worker, or hourly employee out there. So they know their rights and if they do find themselves involved in a wage and hour class action case they know what to do and how to win. It is why I crafted this website with an unpaid wages article library, blog, FAQ page and videos. It is why I offer my book, California Truck & Delivery Driver Wage Theft, here for FREE. Knowledge is power and you need to use that power to get back what you have already earned and now deserve. But you have to act on your knowledge. You have to do something. I suggest you get your confidential, free, no obligation unpaid wages analysis - so you can find out how much you're really owed. Our firm accepts unpaid wages cases from every California-based industry. We represent workers at every level, from laborers to company executives. Over the years we have found some industries are more likely to break California's strict wage and hour laws than others. Information technology engineers, programmers, and system administrators. Financial services employees and support staff. Outside sales and commission sales employees. Workers illegally classified as "independent contractors"
Disclaimer: No two cases are ever the same. Our success in prior cases is never a guarantee of success in other cases. Remember the only things in life that are guaranteed are death and taxes. No one can guarantee any particular result on any case, including wage class action cases and PAGA cases. I suggest that if anyone does guarantee you any particular result. Run. Fast. They are B.S. 'ing you and you should not hire them as your lawyer. Bill Turley interviewed on ABC discussing wage theft Interviewed on ABC news television rebutting companies trying to get away with wage theft. A recent story was aired in Bakersfield and Bill was asked to speak. Forbes Riley and Kevin Harrington Interview Bill Turley Bill Turley explains his new book Truck and Delivery Driver Wage Theft as well as his recent appearance at the California Senate hearing. Joe Theismann Interviews Bill Turley on Drivers & Wage Law Drivers & Wage and Hour Law - In this video, World Champion Quarterback and Entreprenuer Joe Theismann Interviews Attorney Bill Turley about truckers rights.